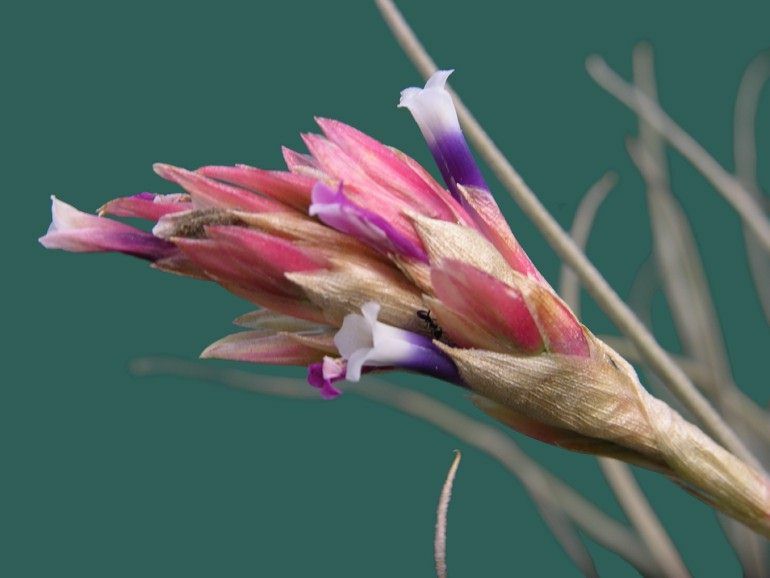 Cultivar of tectorum, registered by Derek Butcher. Mick Romanowski and Peter Tristram collected it in 2003 in Peru, on rocky outcrops just out of Cajamarca on the road to Llacanora at 2700m. Inflorescence is a compact capitate head. Leaves are within the range for T. tectorum but are not tomentose-lepidote as with typical T. tectorum but more subappressed. In other words they look flat grey rather than fluffy white. How important is this diagnostically? For Tillandsia tectorum Smith and Downs (1977) says “Leaves densely imbricate along the stem, polystichous, 2dm long, densely tomentose-lepidote; which includes T. saxicola Mez in Fedde, Repert. III. 41.1906 as a synonym. This is described in Mez (1935) as (my translation from the Latin) “Leaves densely covering the stem, often bent one way, up to 0.25m long, above the sheath up to 15mm wide, then with incurved tip, subulate-filiform gradually narrowing, convolute towards the tip, rigid, covered with many hairy lepidotes. I asked Lieselotte about our problem child which had subappressed trichomes and she advised “We also have collected this plant, we still have it in our collection, and I once saw some imported plants from Knize. 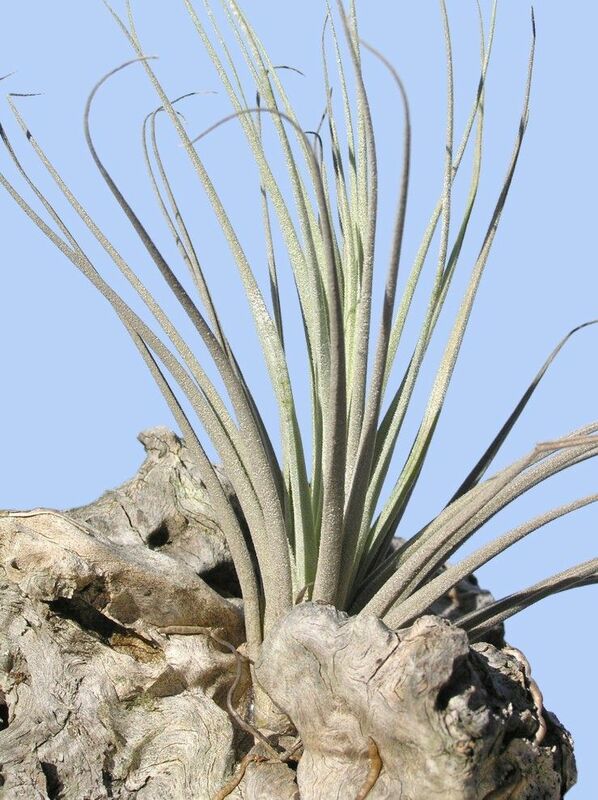 But the Llacanora plant is not the only one with appressed scales, there is another form, epiphytic(! ), from a locality very distant from Llacanora and near to the coast in the Rio Moche-valley on 950m, Prov. La Libertad. Botanically, it would seem these forms with appressed scales are in limboland because of differing points of view as to their diagnostic importance. Therefore, I am recording this difference by giving this form found in Llacanora the cultivar name of ‘Llacanora’. We know that a very similar plant is being grown in Australia by Len Colgan who imported his plant from Doetterer in Germany who we know imports from Knize in Peru. We do not know where Knize collected his plant but we also know that a similar plant was imported from Knize by Eric Gouda in the Netherlands.